Get complete local and remote control of virtually any thermostat function with this X10 Bi-Directional HVAC System that not only responds to X10 commands, but also has the ability to send reports via X10. 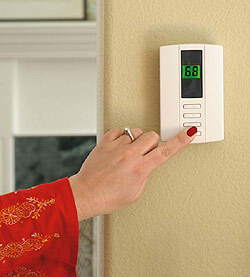 When used with an intelligent home control system, you can have your system automatically respond with any action (i.e. turn on a ceiling fan, open or close dampers, etc.) when certain temperatures are reached. Yet with all its advanced, automated features, the system still offers the complete, manual control that you have with ordinary thermostats. Decode Table B. There are two other decode tables that can be used. See manual for details.